The multi-user capabilities of WordPress make it the ideal platform for publishing content from a range of users. By utilizing the different user roles and capabilities in WordPress, giving others access to your site in a secure way is very easy to manage. In this post we will cover how to add users to your WordPress site so you can expand your team and help your site grow at a faster rate. Whether you want to delegate site maintenance tasks or increase the output by bringing additional writers on board, creating new user accounts is the solution to your access issues. 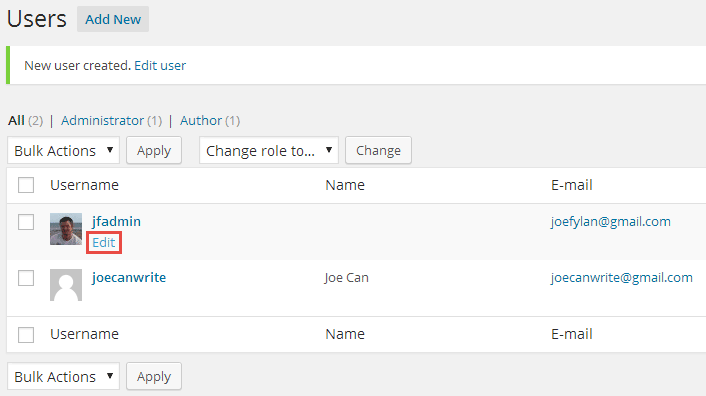 Once you’ve logged into your WordPress admin dashboard you can then access the ‘Users’ admin pages. From there you can view all existing users, add a new user, and view and edit your own user profile. To add a new user to your WordPress site, the first step is to click on the ‘Add New’ sub-menu item on the ‘Users’ menu. From the ‘Add New User’ screen you can then enter all the required details. Once the user has been created, you will be taken to the ‘Users’ page and will see the ‘New user created’ confirmation message. From the ‘Users’ page you can then manage the existing users, including editing and deleting any user accounts. If you checked the send password box on the previous page, the new user will be sent their login details allowing them to login to the site. 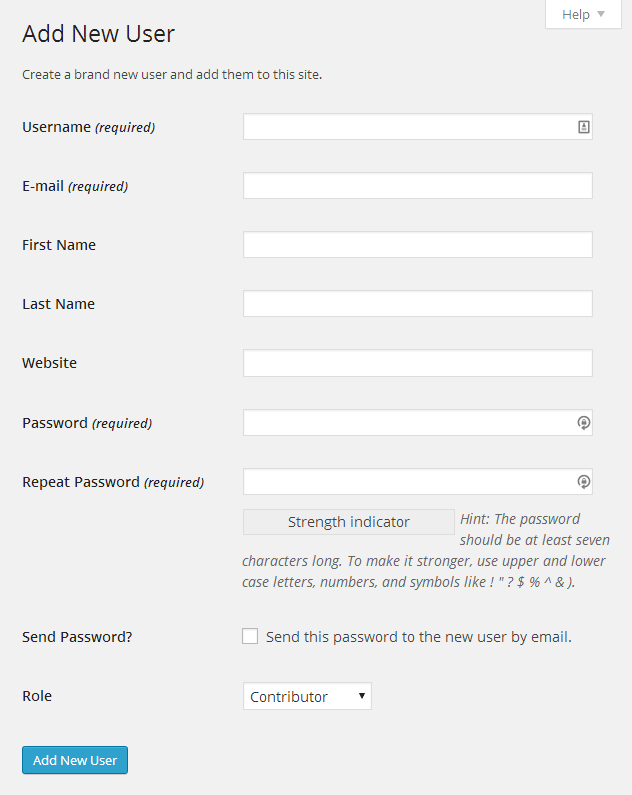 As well as entering the user’s name, you can also enter some biographical information about them. Depending on your WordPress theme, this information might be displayed on a user’s profile page, or after each individual post published by that user. To enter this information, click on the ‘Edit’ button beneath the existing user whose profile you would like to update. From the ‘Edit User’ page you can then enter some biographical information about the user. From this page you can also set the name that is displayed publically on the site for that user when they leave a comment or publish a post. The possible options for this name are derived from their username, first name, last name and nickname. Once you’ve entered the information, don’t forget to hit the ‘Update User’ button to save the changes. As well as creating new accounts on behalf of your users, you can also allow them to create accounts themselves. As well as creating new accounts on behalf of your users, you can also allow them to create accounts themselves. By default this option is turned off in WordPress, but it can easily be turned on if you think you have a use for this feature. To enable user self-registration on your site, login to the admin dashboard, and go to the ‘General Settings’ page, located under the ‘Settings’ sub-menu. About halfway down this page, you will see the ‘Membership’ setting with the option ‘Anyone can register’ and then the ability to set the default role which is assigned to new users who register in this way. From that page, the visitors can enter a username and e-mail address, and then their login details will be e-mailed to them. Don’t give a user a role with too much access. If you do decide to enable the ability for anyone to register a user account, proceed with caution and ensure that you don’t set the default role to anything which gives a user rights and capabilities beyond the level you want them to have. Otherwise you could end up permitting unknown users to create a user account on your site, allowing them to edit and delete existing content, publish new content, and even delete your user account. If in doubt, set the default role to ‘Subscriber’ to minimize the access they will have to your site, or keep the self-registration feature disabled. If you do make use of this feature, by setting the default role to ‘Subscriber’ allows you to change the role once you’ve verified the user’s identity. 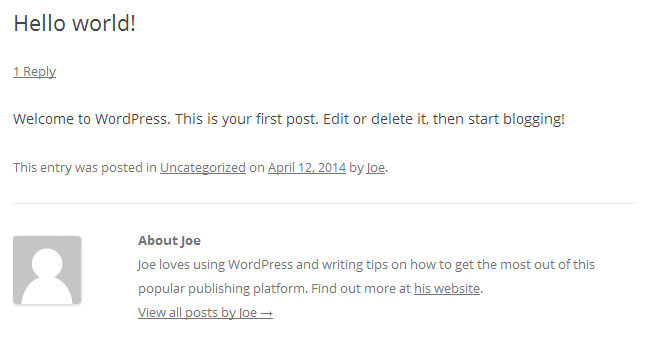 As you can see, creating new user accounts in WordPress is a simple task. However, the main issue to consider is which roles to assign to users, in order to ensure they have enough access and capabilities to carry out the necessary tasks, without granting them too many powers which could give them the potential to cause problems, either inadvertently or deliberately. To get a better understanding of user roles in WordPress, we recommend you read our post on user roles and capabilities if you haven’t already done so.